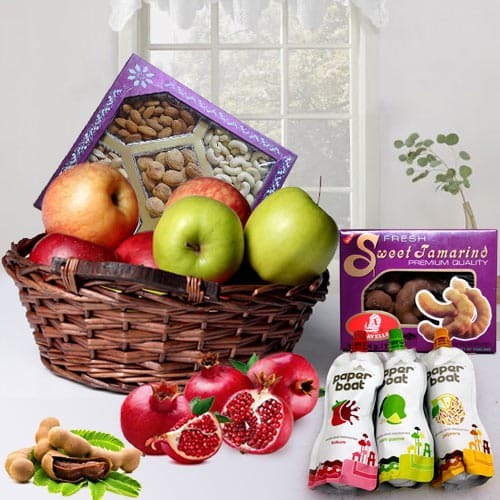 Deliver happiness by gifting this Delicious Happiness Everywhere Fruits N Dry Fruits Hamper to your relatives and friends. This delicious range is teamed with Pistachio (250 gr. ), Paper Boat Fruit Juice (3 Flavours), Pomegranate (1 kg. ), Pears (500 gr. ), Red Apple (500 gr. ), Green Apple (500 gr. ), Sweet Tamarind (250 gr. ), Cashew (250 gr. ), Raisins (250 gr. ), Almond (250 gr.) and Walnut (250 gr. ).